Everyone knows that art activities are fun. Did you know that they also help build skills such as; creative thinking, spatial awareness, problem solving? You can extend your child's learning experience by reading books about art, and visiting the Museum of Fine Arts, Houston. 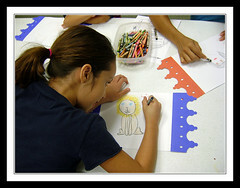 MFAH, is a family friendly environment that encourages both adults and children to explore and discover. They even provide weekly activities and storytimes!